Umbria Jazz 2005 will probably be remembered as one of the best editions ever of the festival. 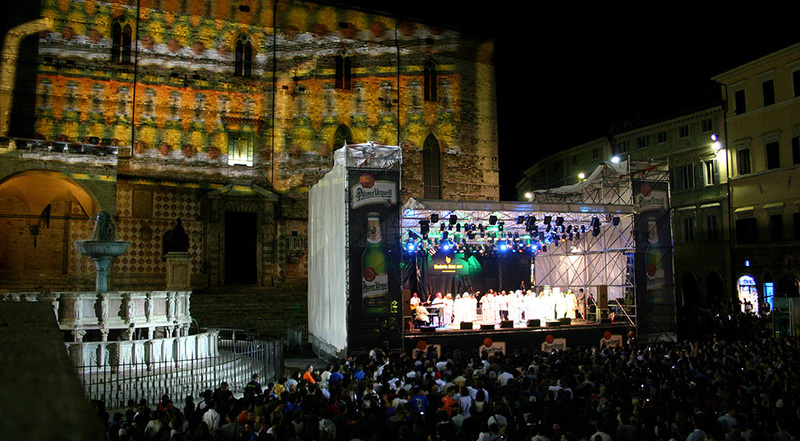 In the past, there have been few light shows like those created in the spaces chosen for the concerts, S. Giuliana Arena, Rocca Paolina (the Pauline Fortress) and Piazza 4 Novembre, which were illuminated with scenographies centred on the Pilsner Urquelli trademark, the new main sponsor of Umbria Jazz. 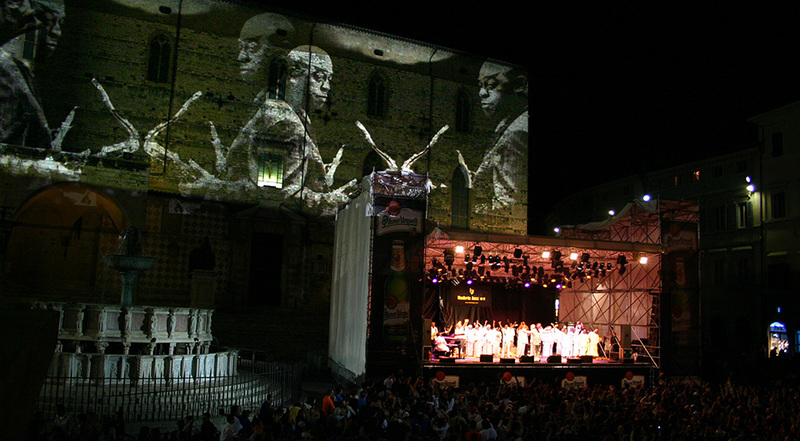 Following a careful inspection of the spaces to be 'illuminated' and after the decision was made as to how many Stark 1200 projectors were to be installed, Paolo Buroni asked me to install the projectors and manage the lighting for the entire Umbria Jazz event. I organised a team of 3 technicians (students enrolled in a course for lighting technicians which we are holding in Umbria) to assemble of the 22 Stark 1200 projectors to be set up in the spaces indicated above. I personally participated offering all of my know-how, my professionalism, my collaboration as well as my passion, time, energy and emotion. If you don't love your work, if you don't get involved, you cannot expect your students to throw themselves into an emotional experience like that of organising a show. The settings were challenging, especially in the Rocca Paolina, where the Stark projectors were positioned inside gutters and buttresses 4 meters high. The Rocca Paolina, a medieval structure, is one of the most symbolic monuments of Perugia. We had to take care not to be invasive of the architectonic spaces with the wiring for power and machine signals, and so we opted for a linear path suspended along the perimeter of the walls to ensure that the visitors and concert goers would only see the beauty of the scenographic effects of the lights projected inside the fortress. Paolo Buroni 's idea was to create an 'Emotional setting' with a multivision of images and synchronised music projected on the stone vaulted ceilings and walls to catalyse the interest of the visitor. A setting in continuous, slow metamorphosis to capture the interest of the passers-by, getting their attention and urging them to stop and submerge themselves in this 'Fantasy of Lights'. Using the Stark projectors and the multivision images, we were able to realise this project in full respect of the strict restrictions of the Monuments and Fine Arts Office through a 'Virtual Ecological' operation in full respect of the historical structures. 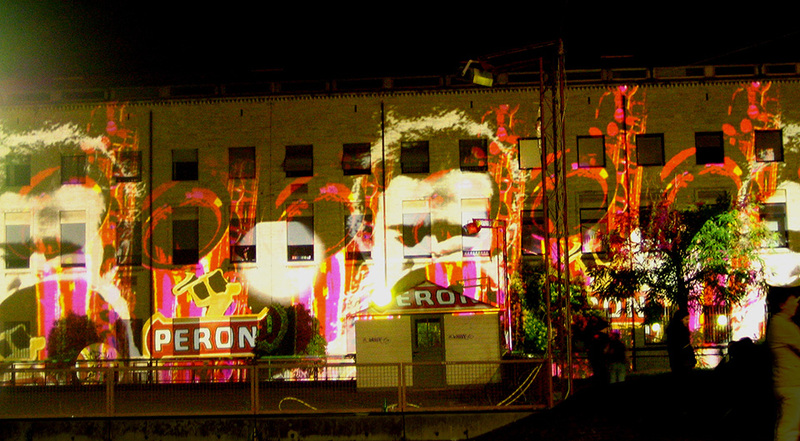 From July 8th to 17th of 2005, we captured the interest and imagination of the thousands of enthusiasts who had come to Perugia for Umbria Jazz, and we drew them into a tapestry of new sensations and emotions woven with the warp and weft of the lights projected in the streets and squares of Perugia which, for the occasion, lent themselves as the stage for the events. for their invaluable help, with a special thanks to Stefano Lazzari, of Umbria Jazz, for his organisational support.